Restaurant and Bar in Ozery Hotel in Moscow suburbs in Russia. Our restaurant is perfect for catering for those who wish to spend unforgettable romantic evening or equally, for those who plan a cheerfully big party. 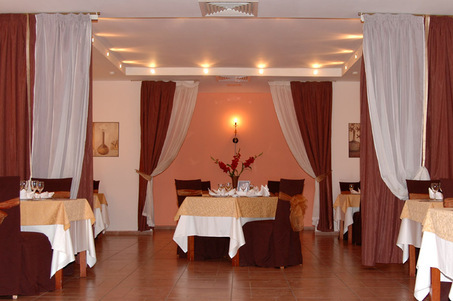 Situated on the ground floor of hotel Ozery, it is sure to cater for your needs! You will be pleasantly surprised at magnificent dishes, their original design and presentation. Our friendly staff will offer you a wide choice of natural coffee and fragrant tea, delicious ice-cream and fruit salads. You need to taste all of them!!! Our restaurant ambience, atmosphere and great food is a great way to perk up anyones mood. A great highlight of restaurant is the variety of dishes we serve - from the cuisine of Russia and Europe, to the exotic and aromatic dishes of the East. The restaurant offers superb quality as well as excellent prices and value for money. Check out the virtual menu of the restaurant on this site. We also offer a breakfast menu (Dishes for breakfast) with special low prices from 7am until noon, offering plenty time to fit in with your daily plans. Not sure of where to spend a relaxing evening, to organize a presentation, conference, business-seminar, business meetings or childrens holiday? Look no further than the Hotel Ozery. Let us organize things for you - whether you plan the relaxing holiday, business meeting/conference, wedding reception, anniversary or banquet, let us arrange it for you. 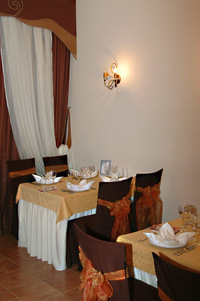 Address of restaurant: ground floor of hotel "Ozery", 1, Soviet per., Ozery, Moscow region, RUSSIA.